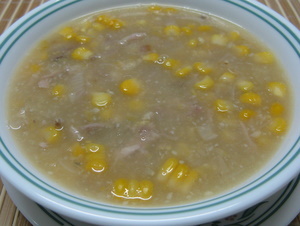 Chicken and sweetcorn soup is a very healthy soup, liked by almost every age group. A hot bowl of this soup is such a pleasant experience especially during winters. Good for a cold and flu. Chicken takes care of the proteins and Sweetcorn is high in fiber, niacin and folate. If you have chicken stock for this recipe it is ideal. But even if you don't have, that's not a problem at all, as long as you have some chicken pieces on the bone. In fact I make it the easy way by making a quick stock then and there. Check out how. To make the quick stock, take about 5-6 decent size chicken pieces on the bone in a sauce pan. Cover with 6 cups water and bring to a boil. Let them boil briskly for 3-4 minutes. Then let them simmer for half an hour (covered), till the water is reduced to 4 cups and chicken is thoroughly cooked. . Then carefully take out the chicken pieces and place on a tray to cool down a bit. Shred all the meat from them, when you can hold them (yes, I use my fingers for that. You can use a fork and knife). Also, strain the stock which you have just prepared. Meanwhile, heat the oil in a cooking pot, add the garlic and onion and saute till the glassy and soft. No need to caramelize (brown) the onion. Add the green chili and shredded chicken. Mix the chicken quickly with the onion. Now pour the stock. When it boils, add the sweetcorn kernels and the crushed corns as well. Stir and season with salt and pepper. Now gradually pour the cornflour mix and stir well. Add more for more thickness. Once the soup reaches your desired consistency, drop in a lightly beaten egg and stir briskly on a high flame. Cook for a minute. That's it, check if the seasoning is OK and serve hot. Let me share a secret. The days I make this chicken and sweetcorn soup, we eat just this and nothing else for lunch. Pretty healthy, I think.